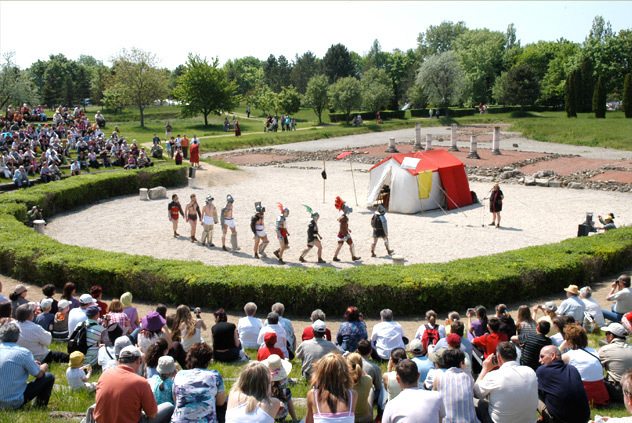 Gorsium-Herculia was a Roman town between Budapest and the Lake Balaton, near Székesfehérvár, 5 km away from the motorway M7. From the middle of the 1 st century a Roman military fortress controlled a road junction and the ford of the Sarvíz. At the beginning of the 2nd century on the place of the military camp a town was built, which became the centre of the provincial assembly of Pannonia Inferior and that of the imperial cult. Exevations started in 1958, uncovering town walls and gates, streets bordered with colonnades, a forum, several temples and civic buildings, halls and sanctuaries of the provincial assembly. Among the structures found were a series of shops, a number of private estates, and even the city's attendant graveyard, fully intact. The town was amnihilated in 260 by a barbarian onslaught, and its place in 290 a new town named Herculia was erected. From this period a great palace, a row shops, two early Christian basilicas, a cemetery beyond the town walls are unearthed. The latest building is the small church of the Medieval village Föveny. The ruins are encircled by a large park of Mediterranean atmosphere, where Rroman tombstones, is an theatre of Greek-Roman character.